Our stay at Swissotel was fabulous. It was the best experience We have ever had while staying in Makkah. Hotel staff is very cooperative and generous. Rooms are very well maintained and clean. Also have very good arrangement for breakfast. The best thing is that its very close to Haram. 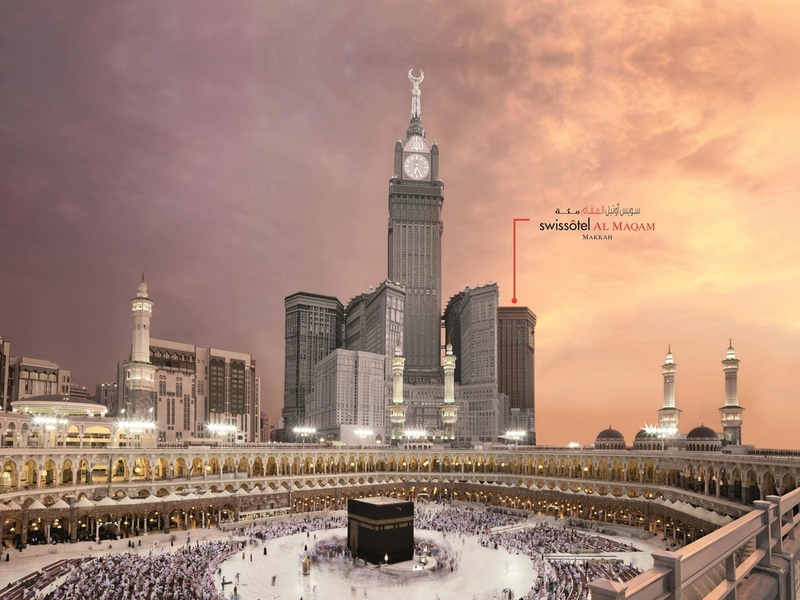 In almost 5 minutes you can reach Kaaba. Overall, me and my family are very much satisfied and inshAllah in future will stay again in the same hotel if got a chance to visit Makkah. Dear Mr. Zeeshan, Thank you for choosing Swissotel Al Maqam Makkah hotel for your stay in Makkah and we are glad to hear that you have enjoyed your stay with us. Looking forward to welcoming you back to our hotel very soon! It wase nice experience and my room wase very beautiful and clean. Food is great and we will definitely return again. Dear Mr. Remal, Thank you for choosing Swissotel Al Maqam Makkah hotel for your stay in Makkah and we are glad to hear that you have enjoyed your stay with us. Looking forward to welcoming you back to our hotel very soon! Great location, service and very welcoming staff. Dear Mr. Ali, Thank you for choosing Swissotel Al Maqam Makkah hotel for your stay in Makkah and we are glad to hear that you have enjoyed your stay with us. Looking forward to welcoming you back to our hotel very soon! What a wonderful stay I had in Swissotel which was the first time and will not be last. Special thank to Mr. Mustafa in reception who was really helpful and cooperative. Dear Mr. Majed, Thank you for choosing Swissotel Al Maqam Makkah hotel for your stay in Makkah and we are glad to hear that you have enjoyed your stay with us. Looking forward to welcoming you back to our hotel very soon! Dear Mr. Abdullsalam Abdullrahman, Thank you for choosing Swissotel Al Maqam Makkah hotel for your stay in Makkah and we are glad to hear that you have enjoyed your stay with us. Looking forward to welcoming you back to our hotel very soon! The hotel facility is good, but I have a comment about the hotel car parking; I was requesting a car parking for my car and I have been informed that they didn't have parking and all their parking lots were equipped. I went to P6 and found there were few numbers of cars only and more than 80% were free!!! When I went back to the receptionist and told him and started arguing with him he gave me!! Why do we have to have such stories?? Why didn't they give me from the beginning?! Dear Mr. Ahmed, Thank you for choosing Swissotel Al Maqam for your recent stay in Makkah. We are happy to know that you enjoyed our service during your stay. As of the rest of your comments, they have been shared with the concerned department in order to be addressed. We look forward to welcoming you in the near future and have the pleasure of serving you once again. الأستاذ محمد، تشرفنا بوجودكم لدى فندق سويس أوتيل المقام مكة ، وإنه لمن دواعي سرورنا أن الفندق قد نال على رضاكم وأنكم قد استمتعتم بالإقامة لدينا. نتطلع لاستقبالكم مرة أخرى بفندق سويس أوتيل المقام مكة. The staff at Swissotel were extremely kind in letting us check in early and for keeping our valuables safe while we made our Umra. The quality of the room and breakfast was great. Dear Mr. Abdiaziz, Thank You for taking the time to write to us, it is always a pleasure to receive such positive feedback, we will defiantly share your comments with our team. I am sure that this feedback will serve as an encouragement to all of our team members as we strive to continuously improve the quality of our services. Thank you again for sharing your experience, and we hope your next visit will be as pleasant as the previous one. Overall experience was very good . Friendly staff and good over all experience . Dear Mr. Shoeb, Thank you for choosing Swissotel Al Maqam Makkah hotel for your stay in Makkah and we are glad to hear that you have enjoyed your stay with us. Looking forward to welcoming you back to our hotel very soon! ضيفتنا العزيزة سناء، تشرفنا بوجودكم لدى فندق سويس أوتيل المقام مكة ، وإنه لمن دواعي سرورنا أن الفندق قد نال على رضاكم وأنكم قد استمتعتم بالإقامة لدينا. نتطلع لاستقبالكم مرة أخرى بفندق سويس أوتيل المقام مكة. Dear Abdullaziz A., Thank you for taking the time to tell us about your experience at the Swissôtel Al Maqam - Tower F. I am sorry that your experience did not meet your expectations; please allow me to express my sincerest apologies. At Swissôtel, we strive to provide a superior service experience for every customer; therefore your feedback is very important to us. Please rest assured that we are taking the appropriate measures to address the problem and prevent future occurrence. We appreciate your sharing your concerns, and it is our hope that you will give us the opportunity to better serve you in the near future. ضيفتنا العزيزة فوزية، تشرفنا بوجودكم لدى فندق سويس أوتيل المقام مكة ، وإنه لمن دواعي سرورنا أن الفندق قد نال على رضاكم وأنكم قد استمتعتم بالإقامة لدينا. نتطلع لاستقبالكم مرة أخرى بفندق سويس أوتيل المقام مكة. Everything was well presented and easy to access. The extra service provided was timely and useful. Dear Saeed A., Thank you for taking the time to tell us about your experience at the Swissôtel Al Maqam - Tower F. I am sorry that your experience did not meet your expectations; please allow me to express my sincerest apologies. At Swissôtel, we strive to provide a superior service experience for every customer; therefore your feedback is very important to us. Please rest assured that we are taking the appropriate measures to address the problem and prevent future occurrence. We appreciate your sharing your concerns, and it is our hope that you will give us the opportunity to better serve you in the near future. I would not rate the property 5 Star. Location and facilities are excellent. I had an experience of staying at Swissotel in Eurpoe which was comparable. Room sound proofing is poor and we had suffered noisy neighbor for all 3 nignts. Despite compliant only a lip service by your security. Nobody picked up reception phone at the time of check-out so we have to carry our bags. Unfortunately this time I was not happy because of the following points: 1. My reservation was connected room and not granted. 2. My reservation was haram view and not granted 3. The room requested to be connected and confirmed but not given. No one called from the hotel to explain to me these points even after pass the message to the reception. We are really satisfied for our stay in your hotel & the service that offered for us & I really wish to offer my special thanks to your employee Mr. Mohammad Zubair which I meet him two years ago in Mariott hotel & he arrange the booking for me in this trip & really he is helpful man . Also on behalf my family I wish to thank Mr. Mahmood H. the response of the room services which he really meet our request regarding all our needs for my family specially my Father & mother which they come On a wheel chair & make them very comfort also wish to thank the Manager of the Breakfast ( Al khairat )resturant which he support them very well. I was initially over charged for my stay March 20 to March 24. I spoke with Mr. Fatimi , he realized the mistake and noted in the system for refund of 583 SAR. He told me that I could easily get my return from the front desk. I went to front desk at least 8 times from March 21 to March 24 until my check out but they kept postponing the refund. At last I met with Mr Hussam at the time of my departure and he assured me of processing the refund. But , I have still not received the refund in my AMEX card as of yet. This is very disappointing. I don't understand why such a big hotel do this to the customers? Please help me in giving my refund back into my AMEX card. Mr . Hussam at your front desk has all my information. My contact number in Canada is 001 -41…. Farhan M.